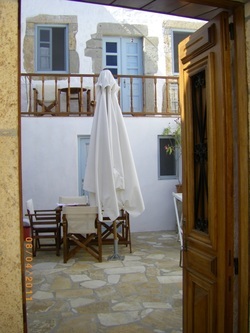 The house is situated in the heart of Chora (the island’s capital) right next to the central piazza of Aghia Lesvia. 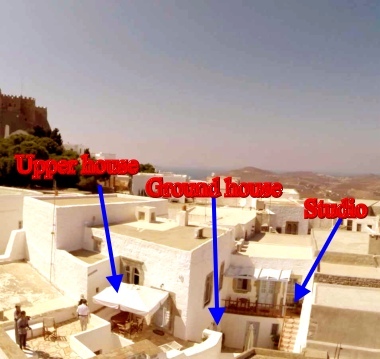 The house has the traditional internal yard around which the 3 houses were re-arranged – a 4 person house on the first floor, another 4 person house in the yard and a 2 person studio on an elevated balcony overlooking the yard (see photo on the right). All houses are fully equipped, they dispose of air conditioning and they are furnished with traditional furniture.The apartments are being rented separately or as a house to a group of friends. All shops, restaurants, taverns, taxis, bus station as well as the Monastery of the Apocalypse are at a walking distance from the house. Daily cleaning and change of sheets/towels every three days.